The LADC2011 will take place at the Conference Center of INPE in São José dos Campos. Beautifully located in the valley of the South Paraiba River, São José dos Campos is a major city in the state of São Paulo, Brazil. It lies about 120 km East of Sao Paulo; it is divided by Via Dutra, the major highway that connects Rio de Janeiro (320 km Northeast) and Sao Paulo, the two most important Brazilian cities. São José dos Campos functions as a major Center for the Aerospace industry of Brazil. The National Institute for Space Research (INPE) coordinates research and development in areas such as engineering and space technologies; Earth observation and space sciences. Also the Brazilian General Command for Aerospace Technology (CTA) has its facilities in the city. There are 53 secondary schools, 14 colleges and universities in the Valley. This combination of privileged geographical position, together with the presence of skilled work force contributes to turn Sao Jose dos Campos into one of the most important industrial and technological cities of Brazil. Embraer and most of Brazilian aeronautical companies are located in São José dos Campos. The population has an average income much higher than that of the rest of Brazil; an infrastructure of commerce and services has been created to cater to both the local consumers and the growing number of visitors. A complete urban infrastructure and a planned industrial park, puts São José on the list of investors, executives and professionals who opt for standard and high quality of life. São José is among the 25 cities in the country with better living, conditions according to the UN and among the nine best cities to do business in the country, according to Magazine Exame. The city has an extensive green area with parks, ecological reserves and Alpine regions. 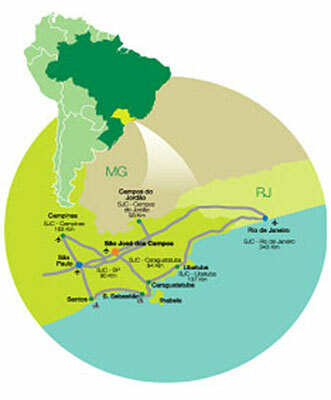 About 60% of the territory of the municipality is regarded as area of environmental protection. All economic and cultural factors put San Jose as an important commercial center of a region with nearly two million inhabitants, which is formed by the Paraiba Valley the North Coast, the Mantiqueira Mountain Range and the Historical Valley. The climate is humid and sub-tropical , with the dry season in winter. In the summer, the maximum average temperature is 29 °C; and in winter, the minimum average temperature is 12°C. The average annual temperature is 20°C. Spring (September - November) and Fall (April - May) are the two best seasons of the year with average temperature of about 24ºC. The official language of Brazil is Portuguese, with different regional accents. Due to the size of the country, there are time zones. The Brazilian currency is the "Real" and it is divided in "100 centavos" (cents). Business holidays include New Year's Day (1 January), Carnival (February or March; dates vary), Easter and Good Friday (March or April; dates vary), Tiradentes Day (21 April), Labor Day (1st may), Corpus Christi (June; dates varies), independence Day (7th September), Our lady Aparecida Day (12 October), All Soul's Day (2nd November), proclamation of the Republic Day (15th November), and Christmas Day (25 December). Brazil is officially a Catholic country. Indian animism was the original spiritual practice in Brazil. It greatly declined when the Catholic Portuguese settlers colonized Brazil, but some still remains. Slaves from Africa that were brought to Brazil had their own religions. The Catholics banned these religions. Some Afro-Brazilian cults evolved during that time, but they are of no resemblance to those of the mainstream religions in Brazil.